Big Rock - Serrated. The Gerber Big Rock Camp Knife was designed by Bill Harsey. 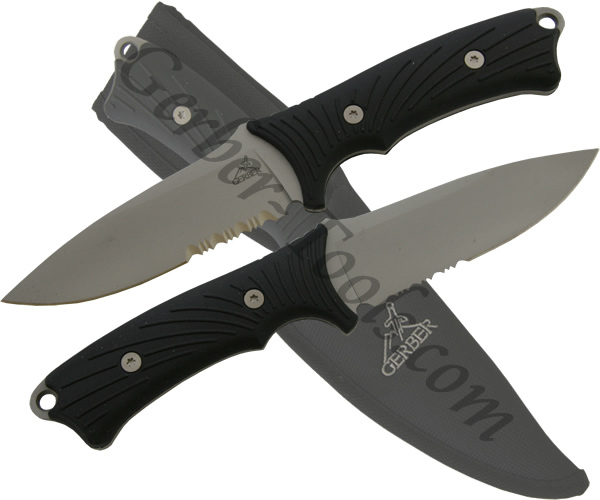 This Gerber 22-01588 model is the serrated drop point blade version. Although the Big Rock is a great knife and it was designed specifically for camping. The full tang 440A stainless steel makes the knife excellent for prying. Softgrip overmolds with texture in the right spots make the handle comfortable and grippy at the same time. A ballistic nylon sheath with a protective insert is included with the Gerber Big Rock Camp Knife.